Looking for a classic toy that your kids will enjoy? This one is for you! Marble games are considered classic because children have been playing this kind of games for so long. They are one of the toys that will never fall out of trend. Not just that, marbles boost your child's eye coordination and they develop many useful skills that will keep your child going. A marble is a small spherical toy that varies in size. Our Marble Game Set includes 40 marbles (16mm or .6-inch) and one shooter (25mm or 1-inch). It includes a Mesh bag that will help you keep your marbles safe from losing. These cool marble set are made up of high quality materials that will ensure its ability to last for a long time that will make your kids enjoy the toy more. You don't have to worry about your kids' safety because we guarantee you that our marbles are made up of non-toxic material. This can be given in any occasion like birthdays and many more. This can also be rewards and can be put in party bags. It will bring tons of fun to kids. Give this out to kids and they will surely have fun. Grab yours now! WHAT YOU GET - 40pcs of Marble Game Set. This colorful marble set includes 40 marbles (16mm or .6-inch) and one shooter (25mm or 1-inch). Mesh bag included. Kids and kids at heart will surely enjoy playing with these awesome marbles. PREMIUM QUALITY - These cool marble set are made up of high quality materials that will ensure its durability. Your kids' safety is at its finest because these are also made up of non-toxic materials. This does not use dangerous ingredients and labeled to be 100% eco-friendly toy. GREAT KIDS TOY - Marble games are considered classic because children have been playing this kind of games for so long. They are one of the toys that will never fall out of trend. Not just that, marbles boost your child's eye coordination and they develop many useful skills that will keep your child going. 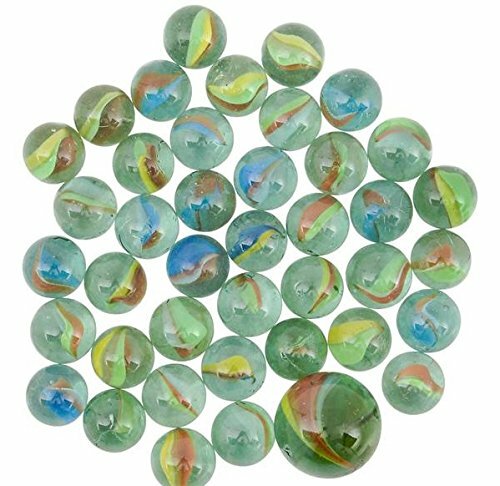 GREAT PARTY BAG STUFFER - Our cool and fun marbles are great to put into your party bags. This can be given in any occasion like birthdays and many more. This can also be rewards that can be put in party bags. It will bring tons of fun to kids.